This entry was posted on June 9, 2014, 1:37 PM and is filed under General Weirdness. You can follow any responses to this entry through RSS 2.0. You can leave a response, or trackback from your own site. It should also be legal to viciously attack anyone doing Monty Python bits in cheesy, fake British accents. YES!!! I’d vote for a Presidential candidate if that were the one issue they discussed. And here’s the sacrilege: I don’t actually think that SNL sketch was particularly funny in the first place – surreal, maybe – especially for BOC fans – and the band members themselves, but how the hell did it take on such a cultural significance? Where did THAT come from…? I was happy they mentioned BOC on Saturday Night Live at the time. It was very cool. But America beats a joke to death like no other culture. I’m a huge fan of the band and really admire their songwriting skills. When I bought my last car, the way I paid tribute to owning it was “Fire of Unknown Origin” from beginning to end driving around. 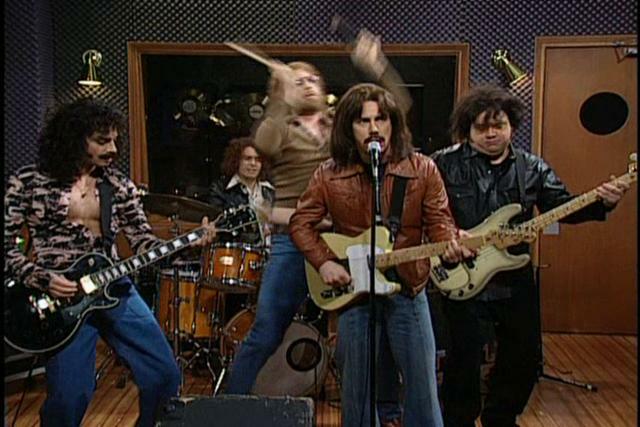 You can’t have a conversation about them with anyone without the eventual “More Cowbell” reference. Everything has to be turned into a communal joke that we can all be a part of. The global village is a hellish nightmare of repetition that even Dante couldn’t have dreamed up. Good for BOC. hardrock would be at a different kilter without them. 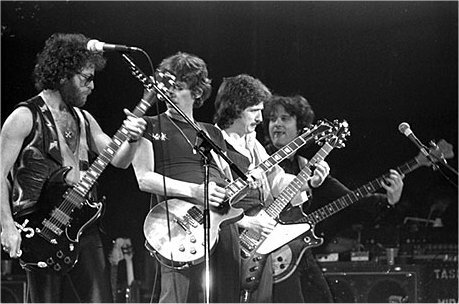 There will never be 5 lead guitarist on the same stage ever again. RIP Al.And fock you C.W. They had the name of the band members wrong. There has been other songs with cowbell. I took a lot of joking from friends because they knew I was a big fan of the band. Snl is so stupid and i ignore the show completely! In the 70’s the show was funny. When twits like lyndsay lohan and miley Cyrus host the show it shows how desparate they are for entertement. Snl-do us boc fans a favor and let boc play reaper on your show. Yes! Finally something about beli blus.